The future for waterfront Ontario looks bright, thanks to your continued support in 2016. FOCA remains a vibrant and financially stable organization, delivering against your key priorities. We’d like to thank our members, our supporters, our lake stewards, and our program and project partners from Kenora to Kingston, Simcoe to Sudbury–and beyond! FOCA will continue to communicate, to educate and to advocate on your behalf, as we have for over 50 years. 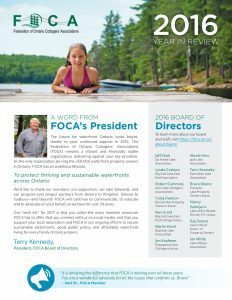 Our “wish list” for 2017 is that you utilize the many member resources FOCA has to offer, that you connect with us on social media, and that you support your local association and FOCA in our ongoing efforts to secure sustainable waterfronts, good public policy, and affordable waterfront living for every family of dock jumpers.